Album release time is always an exciting season for any artist. Make that album one of the most highly anticipated of their career and it adds a little extra something to the release. 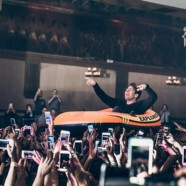 This is the case with rapper Hoodie Allen, whose third record- The Hype– is set for a release very soon and hopefully lives up to its title. If lead single “Sushi” is any sign, this album is set to be his biggest yet. Not long after the release, Allen is set to hit Indy’s Egyptian Room at Old National Centre on October 11 and it’s always a fun party when the energetic rapper hits the stage. Over the last few years, he’s played the Circle City a few times- recently playing the same venue last year as well as local radio station WZPL’s 2015 Birthday bash. Needless to say, Indianapolis knows Hoodie Allen very well and is more than ready to throw down with him. Check out the event page here via the venue website: http://www.oldnationalcentre.com/EventDetail?tmeventid=05005316068E8E44&offerid=0. Tickets are available here: https://concerts1.livenation.com/event/05005316068E8E44. Hopefully you’ll join Hoodie Allen and The Front Row Report for what’s guaranteed to be the perfect way to kickstart your Fall concert season.